You are here: Home / Home / What’s in a Name? 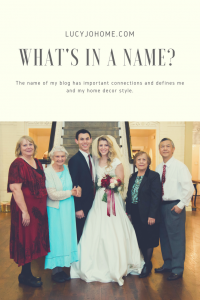 I have strategically named my website Lucy Jo Home because, for one, it is my name, but mostly because these two names carry a lot of significance for me. These names are a legacy that I am determined to carry and pass on to my own children. My grandmother Luzvinda Panganiban came to the United States from the Philippines as a young wife and mother. She displayed serious grit as she learned a new language, raised four children, worked, started businesses and supported a husband through war, career changes and, later, health problems. She embraced all the cultural changes and made a new, solid life despite all the challenges. She was aware that her children would have an easier time being American if they mastered English, so she discouraged them speaking it at home. Although I am sad that the Tagalog language was not passed down, I am certain that my dad felt more American growing up without a thick accent and confusion about language. There may be a debate about how to handle language, but I know that my grandmother had her children’s best interest in mind. She has always had a strong spirit and even now she has no intention of giving up. My dear grandfather has been gone for years now, but she still finds ways to live well. She has taken trips abroad, visited family, and recently had a sunroom built where she walks each day. Luzvinda makes picking out meaningful cards and gifts seem easy. She is generous with what she has and has strong, active faith that has brought her answers and comfort during all the stages of her life. I have been able to hear stories about some of the results of her faithful prayers. She has always loved beautiful and delicate things and created beautiful homes where ever she has lived. She grew up the oldest of eleven children and was no stranger to poverty and hunger before she married. Grandma is full of faith, strength and love for her family, and she has welded a strong link in the chain. Joann Pingree is friendly and fun. She is a veracious reader with a strong sense of self. Even now as dementia sets in, she still has energy and kindness. She loves to ride her bike and wrote me letters my whole life. The letters would tell me about the weather, family news, books she was reading and what kinds of conversations she was having with God. Growing up, our vacations were spent driving across Nevada to see her. The James and Joann Pingree home (where my Grandma still lives today) was full of warmth, home made bread and jam, bottled beans, a plentiful garden and practicality. She didn’t sweat the small stuff. My favorite thing she would say is “Normal is just a setting on a washing machine.” I knew that she didn’t care what other people thought and she thought I was great. I needed and wanted her acceptance as a young person and she gave it readily. Her home is modest, clean and full of so many memories: the “family picture” wall that started with homemade frames (the kind made out of fabric), family dinners and reunions, the dated wallpaper in the kitchen and the swing set that was painted and tipped too many times to count. She sewed her five girls clothes for years and loves to tell stories about my mom flirting with all the boys in the front yard, stealing my grandpa’s car for a joyride and spanking her with a wooden spoon so she would practice the piano. Grandma Pingree has been unapologetic about who she is since I have known her and her legacy of love, faith, learning and service make me proud to carry her name. As you can see I am a mix of these two incredible women that share a love of God and family, but are very different too. My personality, style and home are a reflection of this special mix. I have a love for fine, beautiful things and an equal love for the practical and frugal. Above all though, I have a love of God and family that I try to infuse in every part of my home and my actions. I would be so honored if I could be remembered and valued by my children and grandchildren the way I remember and value my grandmothers. Does you name carry meaning? Does your home and personality reflect the generations before you? What are you sure you want to pass on? I hope that your home reflects the things that you value most and continues to be a safe-keeper of memories and relationships that last much longer than the physical things we collect in our homes. I remember you telling me that your G-ma said the “normal” phrase and I’ve never forgotten it.